March 14 is π day, when we celebrate the dimensionless number that shows up everywhere in our 3-dimensional world! Far from just the ratio of the circumference to the diameter of a circle, π is the archetypical irrational number. People have computed the non-repeating digits of π to at least 10 trillion places, mostly as a computational challenge! I hope they have some apple π in the cafeteria today. SDO did a momentum management burn yesterday at 1901 UTC (3:00 pm ET). We used 51 gr of propellant to drive the reaction wheels to the desired speeds. The high-gain antennas move off White Sands during the burn and we lose about 10 minutes of data. Once the burn is complete the antennas move back into place and the downlink is resumed. Comet PanSTARRS is visible in the evening sky, if you look toward the west just after sunset. Here is a sky map from SpaceWeather.com showing Comet PanSTARRS tonite, between the Moon and Mars. This comet will only get as close as 0.3 AU from the Sun, which is inside of Mercury's orbit but it isn't a sun-grazer. So go out and look for a comet near the Sun. It will be good practice for finding Comet ISON when it goes around the Sun in November, maybe close enough to be seen by SDO. SDO is featured in a YouTube video on Coronal Rain by SciShow. Check it Out! 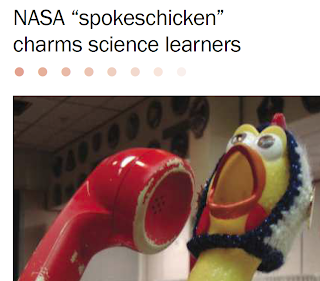 The last page of the February 2013 issue of Photonics Spectra featured the SDO mascot, Camilla Corona SDO. Her latest trips have been to the Emerald City ComiCon in Seattle and the SWSX in San Antonio. Camilla encourages children of all ages to ask questions about the Sun and space. She explores space in her spare time, flying to the stratosphere on balloons. Congratulations to Camilla and Romeo Durscher, her executive secretary for creating an excellent excuse to ask questions. 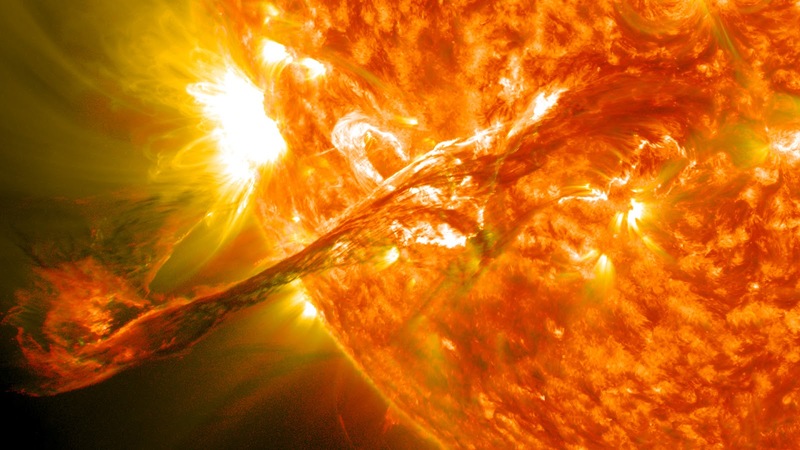 On August 31, 2012 a long filament of solar material that had been hovering in the sun's atmosphere, the corona, erupted out into space at 4:36 p.m. EDT. The coronal mass ejection, or CME, traveled at over 900 miles per second. The CME did not travel directly toward Earth, but did connect with Earth's magnetic environment, or magnetosphere, causing aurora to appear on the night of Monday, September 3. 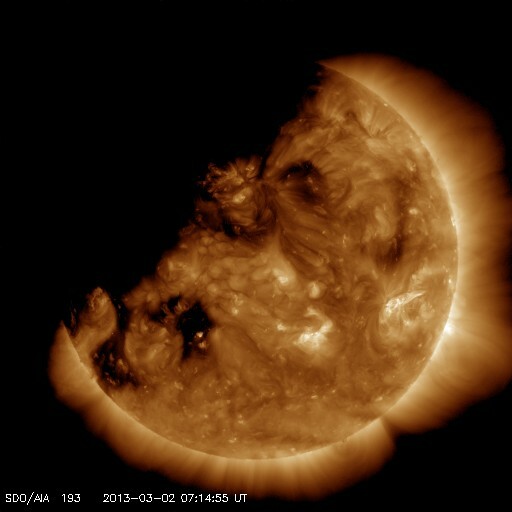 Pictured here is a lighten blended version of the 304 and 171 angstrom wavelengths. The SDO Data Pipeline has had an anomaly and is currently off-line. It should be back up soon. March 2, 2013 saw the first eclipse of the SDO Spring 2013 Eclipse Season. It was a partial eclipse, blocking only the upper left part of the Sun. Here are images from two AIA channels showing the eclipse at around 0715 UTC yesterday. The 193 image on the left shows the highly structured corona with the Earth passing by. The right shows the 1600 bandpass a few minutes later. The 1600 image has a much more uniform flow on the surface of the Sun and a much sharper (though still a little fuzzy) edge of the Earth. There is also a crescent of darkness over the top of the Sun that is not related to the eclipse. The 2013 Eclipse Season continues until March 26. 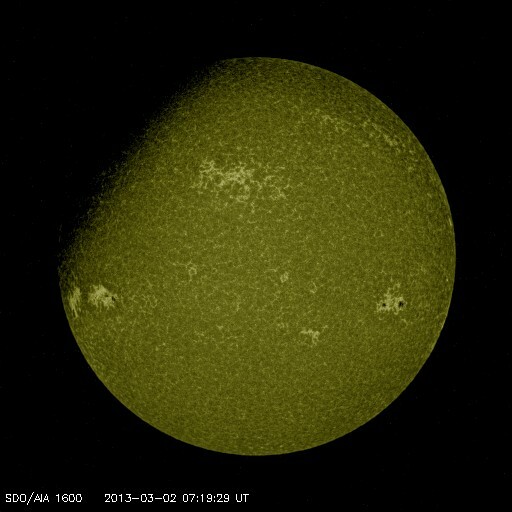 This season also has a lunar transit on March 11, from 1135-1243 UTC, a momentum management burn at 1901 UTC on March 13, and a station keeping burn at 2339 UTC on March 20. Looks like March is going to be a busy month! This afternoon all is repaired. The back-filling of images will progress as the data fills in. The data partition on SDO's Data Delivery System storage area network went down this morning. DDS core processing and delivery of files to the SOC stopped at around 0610 UTC (01:10 am ET). The Front End Processor servers will store all of the data downlinked while the DDS is down. This data will be replayed into the core and delivered to the SOCs once normal operations resume. We are working to recover at this time, and normal operations should resume in a few hours.